The most recent census data lists Florida as the third most populous state in the U.S., and looking around city streets is generally enough to convince a person of that fact. With so many people, it is sadly unavoidable that accidents do happen, especially involving pedestrians. While auto drivers have a duty to exercise reasonable care while on the road, it is also important to take extra precautions to protect yourself while walking in Florida cities, because it is all too easy to wind up in a painful situation if you are not careful. In Smart Growth America’s annual study of urban planning in metropolitan areas, Florida did not fare well. 2016 data lists seven of the top ten metro areas for pedestrian accidents as being in northern or central Florida, with Cape Coral-Ft. Myers topping the list. The Orlando-Kissimmee-Sanford metro area came in third place, with a Pedestrian Danger Index (PDI) of 234.7, which indicates approximately 2.58 pedestrian deaths per 100,000 people. By comparison, the lowest ranked city on the list is Colorado Springs, Colorado, which had a PDI of 13.5, with 0.55 pedestrian fatalities per 100,000 people. The disparity is vast. There are multiple potential reasons for the frequency of pedestrian accidents in Florida. One is the more advanced age of the population – approximately 20 percent of Floridians are over the age of 65, which is above the national average, and it has been well documented that elderly people are at higher risk of accidents of this type (whether due to impaired vision or hearing, not being seen by oncoming cars, or failure to move out of the way of traffic, among possible other reasons). Another often-cited reason is tourism – with many more people present who may not know the roads and/or how to navigate them. If you are struck by a car while walking in a Florida city, you may be entitled to compensation, depending on the situation. Auto accidents are usually brought to court under a theory of negligence, meaning that four criteria must be proven. A duty of care owed to the plaintiff must be shown – though generally, this is implied in Florida between motorists and pedestrians. That duty must have been breached, and it must have been breached directly by the defendant’s conduct. Also, the breach of the duty must have caused tangible harm to the plaintiff in the form of injuries – not necessarily physical, but tangible enough that they would not disappear in mere hours or days. 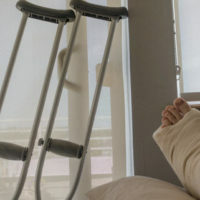 Be advised, however, that unless your injury is serious enough to cause “significant and permanent” scarring or loss of a bodily function, death, or permanent injury within a “reasonable degree” of medical probability, Florida law does not actually permit you to bring suit against the driver who struck you. Florida is a no-fault state, which means that most auto accidents are expected to be handled by insurance companies. All Florida drivers are required to have at least $10,000 in personal injury protection, which goes with you rather than your car. Thus, if you are struck by an automobile and the injuries are not severe, your insurance is expected to cover your bills. Pedestrian accidents can be extremely serious just due to the significant weight disparity between you and the vehicle that strikes you. If you have been involved in one, contacting an attorney to discuss your next steps should be your next call. The Winter Park pedestrian accident lawyers at the Hornsby Law Group are ready and willing to try and assist you with your case. Call us today to schedule an initial appointment.